Set in a tranquil spot, with a lovely local beach a few metres from your doorstep and the village of Kassiopi with its plethora of amenities just minutes away. Set in a tranquil spot, with a lovely local beach a few metres from your doorstep and the village of Kassiopi with its plethora of amenities just minutes away, the location of Villa Aliki could not be better. Boasting unique views of the harbour and castle, with a charming peninsula in the background, a lovely garden and luxurious private swimming pool, this is a unique retreat, where you will be overwhelmed by the authentic and magical atmosphere of this stunning Ionian island. The house itself comprises of three floors and accommodates 10 guests in comfortable and welcoming rooms with amazing sea views. There is also a cosy office area with a sofa bed and home cinema, ideal for some evening relaxation. On the lower level, a gorgeous side terrace accessible from the living room leads to a separate studio, featuring an ensuite double room and well-equipped kitchenette, perfect for couples seeking for a romantic getaway or even for elderly people wishing to enjoy extra levels of privacy. 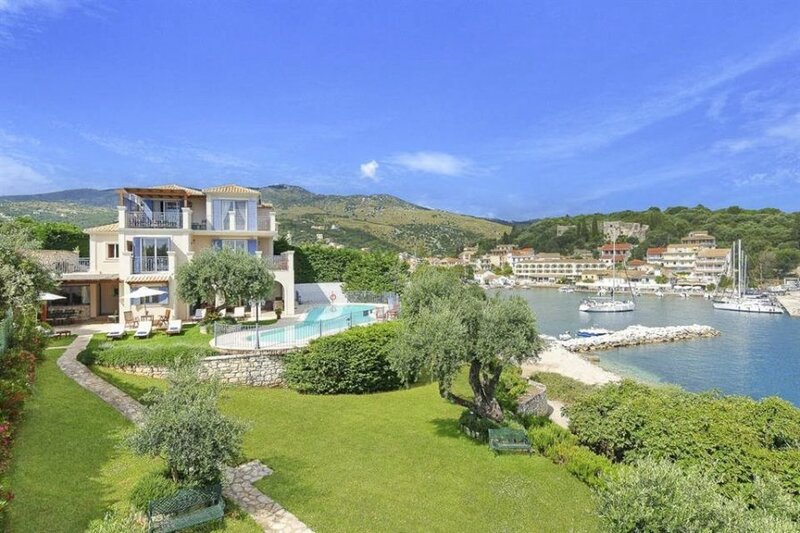 Villa Aliki is one of those rare beachfront properties nestled in the heart of one of the most interesting villages in Corfu: do not miss the opportunity of experiencing an unforgettable holiday. A once quiet fishing village, Kassiopi has turned into a vibrant tourist destination, still preserving its traditions and culture. Located in the north part of Corfu, it is famous for its stunning beaches, lush pine forests, olive groves and for the imposing Mount Pantokrator serving as the backdrop of a natural landscape deeply rich in diversity. This popular seaside resort of swarms of traditional Greek taverns, lively bars and nightclubs as well as a complete range of other amenities such as shops and supermarkets. The closest beach is only 150m away, but a short drive will also take you to a number of almost unspoilt Blue Flag bays such as Avlaki, particularly suitable for families with small children. To fully take advantage of all the beauties the Corfu coastline has to offer, we suggest hiring a boat (Agios Stephanos, Avlaki or Kalami) to explore the hidden treasures along the coast. Corfu town (37 km) seems like a fresco painting that has come to life. The Liston's elegant arcades hang over the marble paved square where the locals gather for a cup of coffee or a drink. The old part, with its special design and quiet, narrow roads is the biggest preserved medieval town in Greece. Boasting an abundance of natural beauty, stunning beaches, candlelit restaurants, romantic bars, a vivid nightlife and vast options for entertainment, covering all tastes and styles, Corfu is probably the most famous Greek island attracting thousands of visitors every year. Simply fill in the concierge request form or contact the Oliver's Concierge Team.